Missing one or several teeth? Go Dental in Calgary provides comprehensive dental implant services as a restorative treatment option for anyone that is looking to restore the aesthetic look and functionality of their smile. One or several missing teeth left untreated for a prolonged period of time can wreak havoc on general dental and oral health. After a careful and thorough evaluation, our dentists will be able to determine if dental implants are right for you. For patients planning to undergo the dental implant process, we encourage you to ask us about IV sedation, as this may be a good option for you. 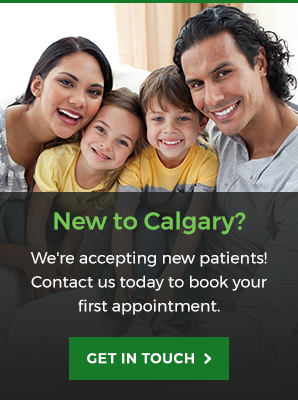 Our Calgary dentists at Go Dental will conduct a comprehensive oral examination. The exam will consist of a series of x-rays that include your head, teeth and jaw, as well as a physical inspection to determine whether dental implants are the appropriate treatment for you. Your first appointment will consist of a dental implant being inserted into the jawbone below the gum tissue. The dentist will place the abutment, which is a titanium post that serves to connect your new tooth to the implant once fused to the bone. While awaiting the fabrication of your new artificial tooth, a temporary tooth is attached to the implant. During your second appointment, the temporary tooth is removed and the permanent artificial tooth is fused to the abutment. In the case of a row of several missing teeth, a fixed bridge is anchored to dental implants which can create the semblance of a row of natural-looking teeth. Contact our Calgary team at Go Dental for personalized and detailed information regarding dental implant treatment.